Ezra Mellinger bounded down the homestretch, pulling away from the field and punctuating his victory with a smile and a single clap as soon as he crossed the line. 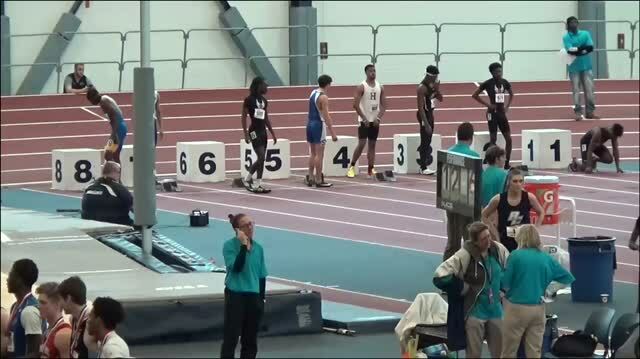 He was the clear winner of his heat, the first and fastest section of the 60 meters. It's not hard to see this is an athlete who has fun doing what he does. "I just love doing track," he said. "It's what I do all the time." 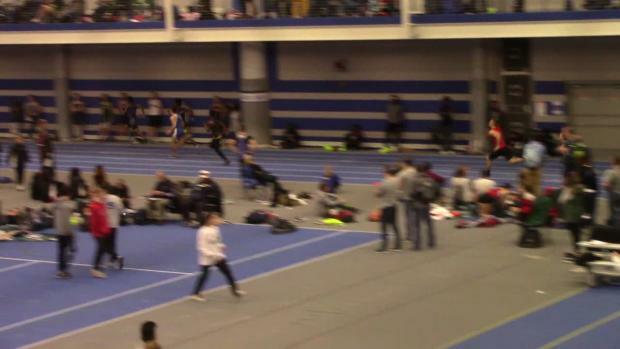 In that moment, the Lampeter Strasburg senior won the 60 meters, going sub-7 seconds for the first time in his career. It was his first of two sprint victories of the day at Saturday's Franklin & Marshall Invitational #2 in Lancaster. He later added a win in the 200 meters. But the sprints are not even Mellinger's specialty, despite the fact that he's rapidly risen the ranks this winter to become one of Pennsylvania's top sprinters. Mellinger is the top-ranked long jumper in the state by nearly a full foot. On Saturday, he matched his season best and PR in the event, leaping 23-08.5 for his second of three individual wins during a busy meet. That jump also puts him at US No. 6 as we approach the end of January. But the PA#1 long jumper admits he probably has even more to give. At F&M, Mellinger narrowly fouled on his first two attempts before going with a more conservative approach on his third and final attempt. That's when he matched his state-leading jump. "On my first two (attempts) I was a little disappointed in myself because they were great jumps, but they were both fouls," he said "I was real fired up but I knew I had to tone it back a little bit, so I could at least get one in. "I was pretty pleased with the consistency...even under stress, I was able to get a 23," he added. 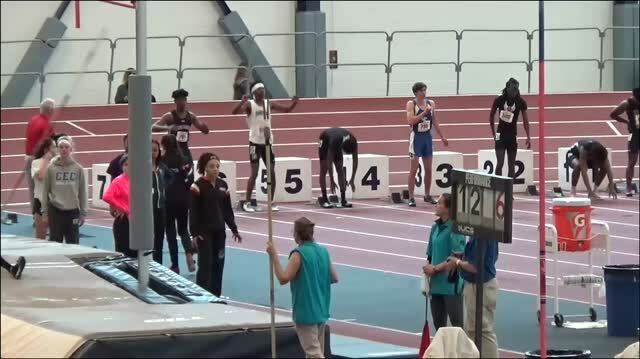 Last winter, he placed third at the indoor state meet, less than four inches off the state title in a very competitive battle with Edner Dorwil and Ayden Owens. This year, he'll have a great shot to move up to the top spot, with his improvements in the event. In the sprints, Mellinger has become one of the state's top breakthroughs. 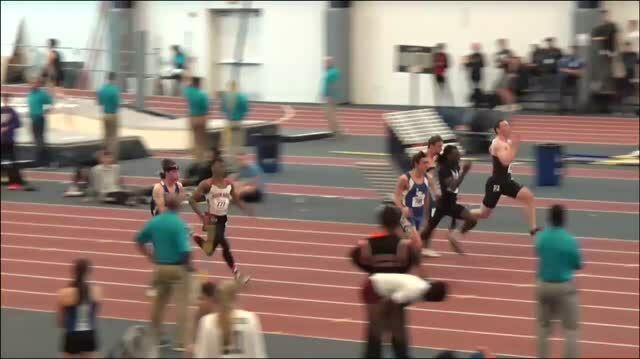 A year ago, Mellinger missed out on state qualifying in the the 60 meters. 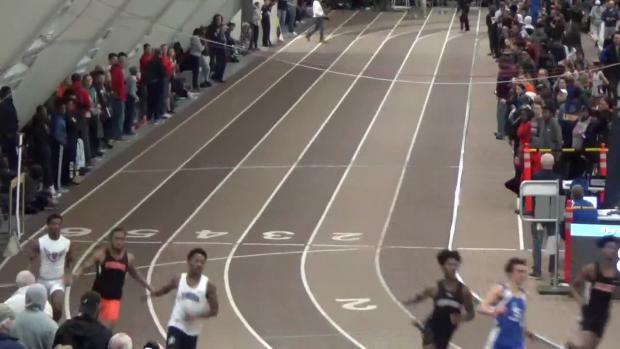 This year, with his 6.96 PR, he's one of the top threats in what looks like a wide open event, as one of just eight boys statewide to crack into 6-second territory. "I knew what I had to do," he said of his first career sub-7 performance. "I just went out and did it and it turned out pretty well." 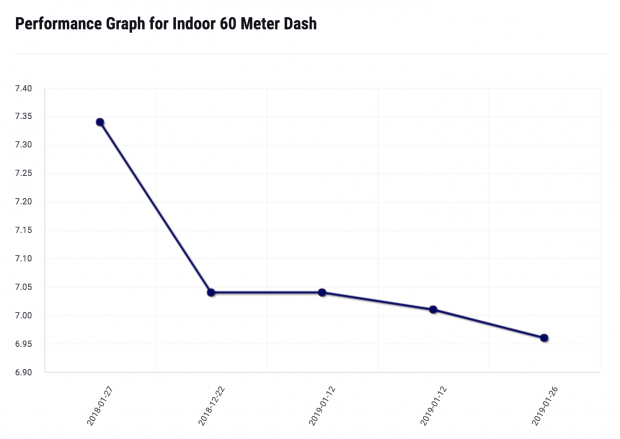 The chart above shows his improvement over 60 meters since last season, where his best was 7.34. See more of his year-over-year progressions here. "Sub-7 had been on my mind since the beginning of the season and I've been inching closer and closer to it, so i was really happy to finally get there," he said. Mellinger is bound for the academically prestigious Duke University next year, but the senior doesn't seem to overthink his sport. Instead, that joy of competing propels him through. His win in the 200 meters came at the end of a long day at F&M on Saturday. In his third event of the day, Mellinger was feeling the effects. He got a good challenge from the talented Jerome Jessup of Red Lion on his inside, but Mellinger kept him at bay, holding on for the win in 22.58. "I was tired, but then again my coach told me what I needed to do and I knew what I needed to do and I had a goal set to get in the 22s, so i just went out there and did it and had fun with it," he said. Next up for the L-S star is the PTFCA Carnival in two weeks. He'll get a good test against some quality opponents ahead of February 24's PTFCA Indoor State Championships at Penn State. Mellinger, who said he'll end his season at New Balance Nationals Indoor, will contend for state titles in three events. For now, he's the one to beat in the long jump at PA#1. 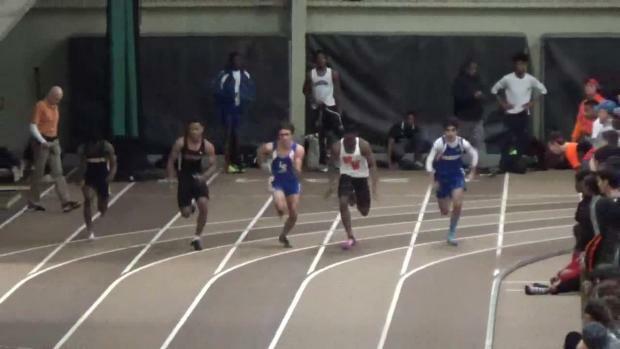 He sits at PA#4 in the 60 meters and PA#15 in the 200 meters (though his time from Saturday came on a flat track). Mainly, he's just looking forward to competing with the best of the best. And he'll have fun doing it. "It's always fun to get some competition," Mellinger said of his tough upcoming schedule. "That's where you see the biggest improvement when you have the best competition."